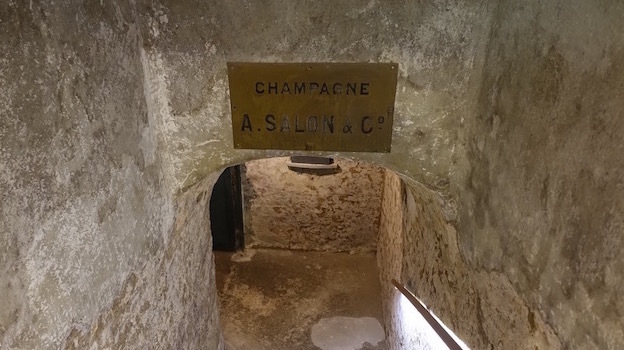 Salon remains one of Champagne’s most mystical and elusive wines. Since 1905, the house has declared just thirty-nine vintages. This vertical tasting of Salon and sister property Delamotte provided a great opportunity to revisit a number of reference point vintages and also taste the latest releases. What started off as a simple tasting turned into something much more elaborate than I could have ever imagined when I first made my appointment at Salon. Salon/Delamotte President Didier Depond dug deep into the cellars and opened a stunning range of older wines for a small group of tasters. 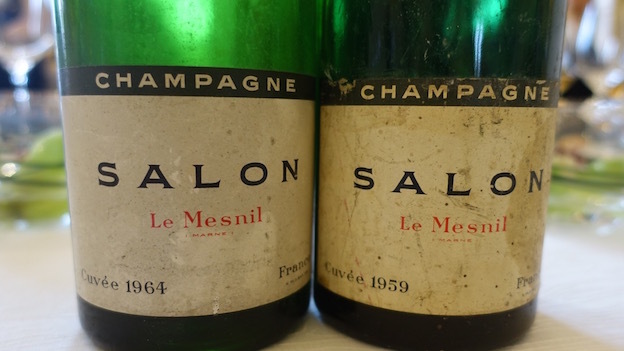 The Salon vintages went all the way back to 1959. We also tasted a number of older Delamottes back to the 1970. When Salon does not declare a vintage, the wines go to Delamotte, Salon’s sister property and neighbor. Because of that, the Delamotte Champagnes are often mentioned as an after thought. That is a shame, because the Delamotte Champagnes deserve to be appreciated on their own terms, a point that is made eloquently in tasting top-flight vintages such as 2004 and 1996 that were declared at both houses. Stylistically, the two wines are quite different. Delamotte’s vintage Blanc de Blancs, a blend of fruit from Le Mesnil-sur-Oger, Oger, Avize and Cramant, is made in a relatively open-knit style. Unlike Salon, Delamotte sees full malolactic fermentation, which softens the edges and gives it the creaminess to drink well with minimal cellaring. Delamotte’s late-released Collection Champagnes, spend more time on their lees and generally see a bit less dosage than the original release. I have been fortunate to taste quite a few of the Collection wines over the last few years. At their best, they are truly special. This flight of Delamotte Champagnes shows how the best vintages can drink well young, but also age. Some of the older Collection wines in this flight are truly remarkable. 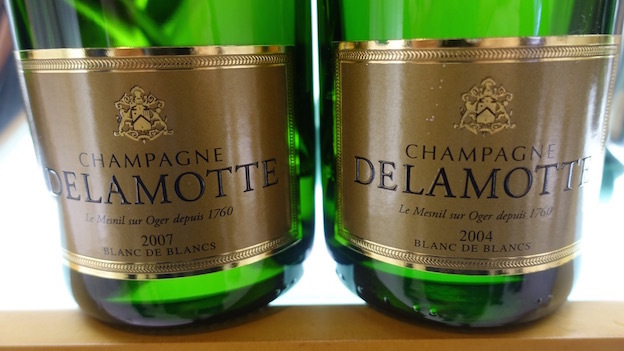 Delamotte’s 2007 Blanc de Blancs is deep, fleshy and seductive, with lovely textural depth and nuance throughout. The 2007 is a relatively soft, open-knit Delamotte that will drink well upon release. I especially admire the wine's sense of balance and overall proportion, two of the many qualities that give the 2007 its considerable appeal. The 2004 Blanc de Blancs has developed notable aromatic complexity and nuance over the last few years. Smoke, slate, candied lemon and crushed rocks are some of the signatures. Striking in its precision and nuance, the 2004 is once again absolutely brilliant. Simply put, the 2004 is a phenomenal Delamotte that shows just how compelling this vintage is in the Côte des Blancs. A late-release from the Delamotte, the 1999 Blanc de Blancs Collection is a gorgeous Champagne for drinking now and over the next decade or two. Extended time on the lees has given the 1999 much of its texture and overall nuance. Honey, chamomile, hazelnut, dried herbs and apricots form an attractive fabric of scents, aromas and textures. Still quite young, the 1999 has enough freshness to drink well for many years. The 1999 is made in an especially big, phenolic style for Delamotte. Another superb wine, the 1996 Blanc de Blancs Collection (magnum) opens with striking, slightly reductive aromatics. Slate, peach, apricot pit, chamomile and lightly honeyed notes are all beautifully delineated throughout. The 1996 is a vinous, rich Delamotte that is peaking today. Brilliant in the glass, yet also pliant and deep, the 1996 impresses with its exceptional balance and total class. From magnum, the 1996 is especially fine. The 1995 Blanc de Blancs is soft, open-knit and ready to go. A host of yellow stone fruits, wild flowers and lightly honeyed notes flesh out as the 1995 shows off its radiant personality. A slightly mushroomy note suggests the 1995 is mature. Any remaining bottles need to be finished off. Delamotte's 1985 Blanc de Blancs Collection is the product of a freakish vintage with a brutally cold winter and spring followed by a very hot summer. Rich, powerful and concentrated in the glass, the 1985 is decidedly voluptuous in feel. Scents of hazelnut, orange peel, caramel and earthiness add nuance through to the vinous, textured finish. The 1985 is peaking today, which makes it an excellent choice for drinking over the next handful of years. Tasted from magnum, the 1970 Blanc de Blancs Collection is just as fabulous as it was the last time I tasted it a few years ago. Specifically, the 1970 offers a striking combination of nuance that has developed in bottle over the last 45 years, yet it also retains remarkable freshness. Scents of orange peel, nutmeg, cinnamon, herbs and honey add intrigue, but it is the wine's timelessness that impresses most. What a great way to wrap up this tasting. Readers who have a chance to taste the 1970 Delamotte Collection from magnum should not hesitate, as it is truly Spectacular. With a capital S.
It is hard to pick a highlight or two in this stunning set of Salons back to 1954. The trio of recent stellar vintages – 2002, 1996 and 1988 – all show beautifully. The just-released 2004 looks like it will take its place among the truly epic editions of Salon. Among the older wines, I especially like the 1961. Both the 1959 and 1964 are past prime in my view, but, then again, that is part of what makes wine such a personal experience. In this tasting, all of the Salons from 1995 and older, except the 1959 and 1964, were disgorged à la volée, with no dosage, which means the bottles are not fully representative of the commercially available versions of those wines. The 2004 Salon has been superb each time I have tasted it over the last year or so. Bright, tense and crystalline, with all of the energy that is typical of both Salon and the vintage in the Côte des Blancs, the 2004 bristles with superb precision and cool, pulsating minerality. 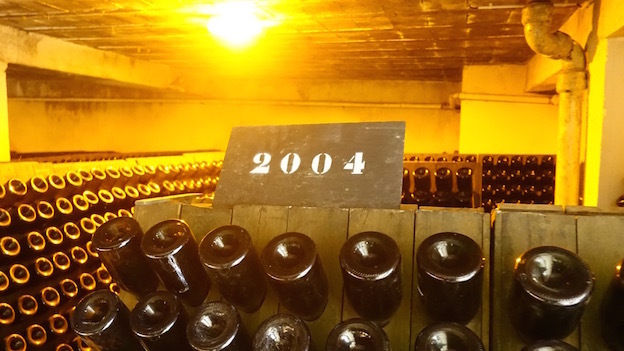 The 2004 spent a dozen years on its lees. Over the last six months or so, it has gradually begun to open up, but it is very much a wine for the cellar. Two thousand four is remembered as a vintage with record high yields. Salon (and Delamotte) did a terrific job in keeping the vines well balanced. Production was just 46,000 bottles, as opposed to the 60,000 or so that is more typical. Chef de Caves Michel Fauconnet opted for a low dosage of just 4 grams per liter. This is a tremendous showing. Another highlight in this vertical, the 2002 Salon is also fascinating to taste after the 2004. Rich, opulent and intense, yet also very classic in the Salon house style, the 2002 possesses superb persistence and depth. The radiant vintage has softened the contours and given the wine fabulous depth to match its decidedly powerful personality. At the same time, the 2002 remains quite youthful. Next to the brighter and more finessed 2004, the 2002 offers more of a baritone-inflected expression of Chardonnay. The 1999 belongs to the family of warm, ripe vintage at Salon. An atypically big, dense wine by Salon standards, the 1999 is somewhat one-dimensional and not likely to improve considerably from here. At the same time, the 1999 has more than enough depth to drink well for a number of years. All things considered, the 1999 has held up well. Didier Depond, the house’s President, describes 1999 as a year with very hot, sunny weather during the summer and into the harvest. Late season rains were an issue for the Pinot, but not for the Chardonnay. One of the surprises in this vertical, the 1997 Salon is super-polished, delicate and refined. The 1997 offers lovely detail and nuance throughout. Hints of candied lemon peel, white flowers and white pepper add an element of brightness that complements the wine's natural richness. Although 1997 doesn't belong to the group of elite vintages at Salon, it does come close to that level. Perhaps even more importantly, the 1997 is aging gracefully and should continue to drink nicely for a number of years. 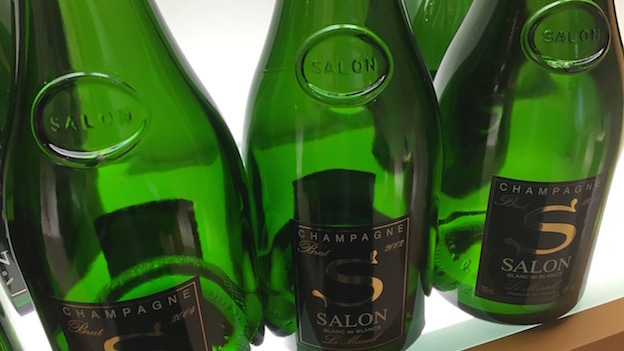 The 1996 Salon is just beginning to enter the early part of its plateau of maturity. Time in bottle has softened some of the razor-sharp focus the 1996 had when it was first released, but all of the energy it had as a young Champagne remains. A host of candied lemon, almonds and wild flowers punctuate the sculpted, persistent finish. Readers who own the 1996 can look forward to another two decades or more of exceptional drinking. This is the ultimate expression of Champagne as wine. The 1995 Salon, disgorged à la volée and naturally sans dosage, is rich, ample and creamy. In this vertical, the 1995 stands out for its broad, ample frame and tropically-leaning overtones. So often, Salon is a Champagne of tension and focus. Even without dosage, the 1995 is distinctly more ample than is the norm and yet all the elements come together nicely just the same. One of the few disappointments in this tasting, the 1990 Salon comes across as oddly evolved and disjointed today. It is hard to believe this is a representative bottle. After the lackluster 1990, things get back on track quickly with the 1988 Salon, a wine that is absolutely peaking today. 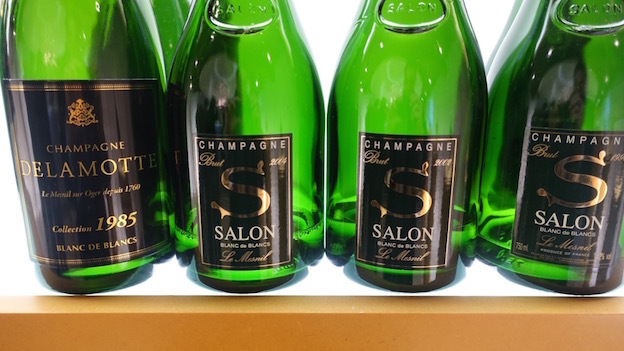 From one of the all-time great vintages in Champagne the 1988 Salon exudes power and explosive intensity, with superb balance and pulsating acidity that gives the wine its drive. A host of candied lemon peel, hazelnut, smoke, licorice and anise overtones meld into the super-expressive finish. The 1973 Salon is one of the most exotic and flamboyant wines in this tasting. Now at the absolute peak of its maturity, the 1973 graces the senses with hints of orange peel, burnt sugar, butter and smoke. Even with all of its depth and creaminess, the 1973 possesses tons of nuance, not to mention considerable personality. What a pleasure it is to taste the 1961 Salon. Timeless, elegant and super polished, the 1961 has aged exceptionally well. The candied lemon, white flower and almond nuances offer lovely freshness, especially for a wine of this age. Today, the 1961 is sublime. I don't know that there is too much more I can add, except to say this is about as good as it gets for mature Champagne. The 1959 Salon is the first of two wines served blind towards the end of this vertical. Although the 1959 retains considerable power for a wine of its age, it is also past peak. Hints of orange peel, butter, spice and brown butter give the 1959 its oxidative, fully mature personality. 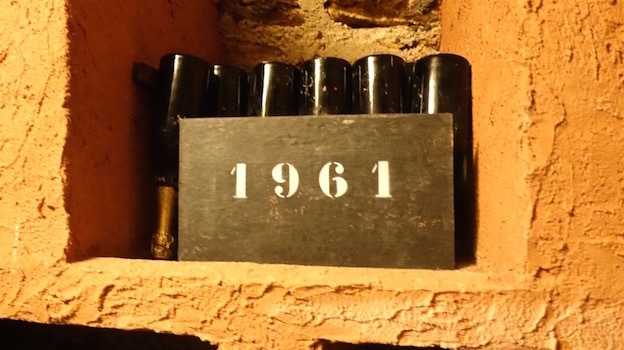 The 1959 is not my cup of tea, but readers who like very aged Champagne might find some pleasure in the 1959, a wine that is hanging on to the very final vestiges of life at this stage. The 1964 Salon, also served blind, is frankly past the point where I find pleasure in wine. The hazelnut, orange peel, tobacco, honey, caramel, spice and mushroom notes are fully tertiary.